Last night, I was at the Magic Castle watching magicians doing the most mind-bending tricks. One magician cut open an orange and pulled out a folded-up playing card. Of course, seconds earlier it was the same card that an unsuspecting woman drew from a full deck. How’d he do that?! That orange reminds me the boiled-eggs my friend Pirikara cooked up a few weeks ago: watch this video. Imagine your boyfriend/girlfriend presenting you with a lovely, homemade bento bento. Inside are rice balls, golden chicken nuggets, carrots…and what’s this? 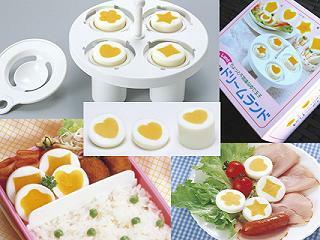 Boiled eggs with a heart-shaped yolk?? How?! If anything, it’s a way to get fickle kids excited about eating. You can tell them you literally stuck your heart into the meal so they should eat it all up. Haha, what a way to traumatize a kid. Earlier this year, Cyril completed his eleventh two-hour television special there. Last Saturday, April 7th, he was crowned Magician of the Year (for 2006) by the Academy of Magical Arts during their annual award ceremony at the Beverly Hilton Hotel in Beverly Hills. Though his popular television specials have aired only in Japan, Cyril has become a hit stateside because of a series of astonishing clips that were uploaded to the internet. These include a humorous skit where Cyril, dressed as a very old man named Serojiisan (“Grandpa Cyril”), travels through the city and literally sneezes his head off. Born in California in 1973 to an Okinawan father and a French-Moroccan mother, Cyril traveled to Japan as a teenager where he performed in Shinjuku bars and lived off ramen noodles. Since then he’s risen to the top, where he amazes everyday Japanese people with his extraordinary, up-close illusions live on camera. His programs take him all over the country, from Okinawa to Sapporo to Kokusai Forum Theater in Tokyo and more. If it weren’t for websites like YouTube, most Americans would never know about Cyril. Now that his reputation has spread, he may very well take over Western TV, too. He is already revered by international magicians, as his recent award attests. In a signature piece, Cyril pulls a real hamburger off a menu and eats it. Yum! Did you notice? In the clips, we don’t just see reactions from people at the scene; we also see random reactions from studio audience members who appear in small squares in the corner of the screen. This style choice is typical of Japanese television programs.